Lamu, Kenya. 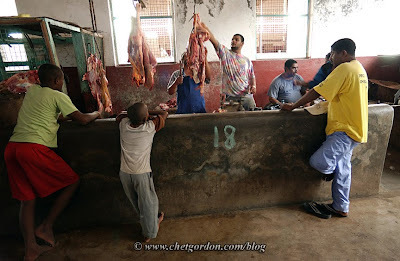 Family butcher shop in Lamu, Kenya on Saturday, May 13, 2006. Lamu Island is a part of the Lamu Archipelago of Kenya. Lamu Old Town, the principal inhabited part of the island, is one of the oldest and best-preserved Swahili settlements in East Africa. Built in coral stone and mangrove timber, the town is characterized by the simplicity of structural forms enriched by such features as inner courtyards, verandas, and elaborately carved wooden doors. Lamu has hosted major Muslim religious festivals since the 19th century, and has become a significant center for the study of Islamic and Swahili cultures. The island is linked by boat to Mokowe on the mainland and to Manda Island, where there is an airport. There are no roads on the island, just alleyways and footpaths, and therefore, there are few motorized vehicles on the island. Residents move about on foot or by boat, and donkeys are used to transport goods and materials. A port was founded on the island of Lamu by Arab traders at least as early as the fourteenth century, when the Pwani Mosque was built. The island prospered on the slave trade. After defeating Pate Island in the nineteenth century, the island became a local power, but it declined after the British forced the closure of the slave markets in 1873. In 1890 the island became part of Zanzibar and remained obscure until Kenya was granted independence from Great Britain in 1963. Tourism developed from the 1970s, mainly around the eighteenth century Swahili architecture and traditional culture. ~ from Wikipedia. A showcase for some of my favorite images here on the blog that aren’t particularly in the working portfolio. Look for this occasional feature where I’ll highlight a single image that’s meant a lot throughout my career. *To see my previous posts of this ongoing retrospective, click HERE. -cg. This entry was posted on Saturday, November 13th, 2010 at 6:06 PM. It is filed under REWIND and tagged with africa, kenya, lamu, mena, muslim, REWIND. You can follow any responses to this entry through the RSS 2.0 feed.